This volume is a revised and enlarged version of Chapter 3 of. a book with the same title, published in Romanian in 1968. The revision resulted in a new book which has been divided into two of the large amount of new material. The whole book parts because is intended to introduce mathematicians and biologists with a strong mathematical background to the study of stochastic processes and their applications in biological sciences. It is meant to serve both as a textbook and a survey of recent developments. Biology studies complex situations and therefore needs skilful methods of abstraction. Stochastic models, being both vigorous in their specification and flexible in their manipulation, are the most suitable tools for studying such situations. 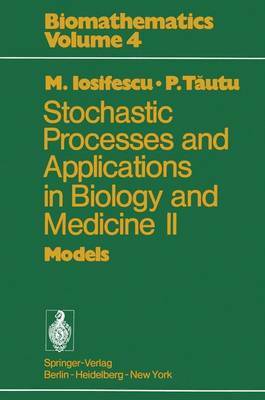 This circumstance deter- mined the writing of this volume which represents a comprehensive cross section of modern biological problems on the theory of stochastic processes. Because of the way some specific problems have been treat- ed, this volume may also be useful to research scientists in any other field of science, interested in the possibilities and results of stochastic modelling. To understand the material presented, the reader needs to be acquainted with probability theory, as given in a sound introductory course, and be capable of abstraction.